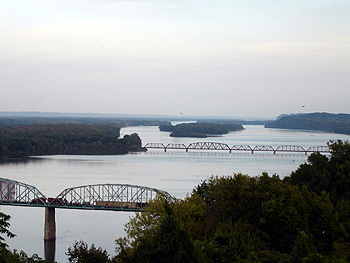 Linking Mark Twain's hometown of Hannibal to the smaller cities of Louisiana, Missouri's Highway 79 runs parallel to the mighty Mississippi River. All three communities were once riverboat boomtowns; their Italianate and Victorian architecture a tribute to their wealthy settlers. 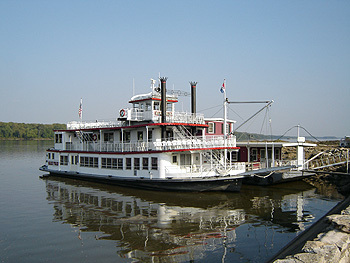 Like many boomtowns, the wealth provided by the riverboats and railroads went away and many of the old mansions and businesses were abandoned. But yesteryear is being revived. Route 79 offers a scenic drive with a tourist's eye view of Old Man River, rolling hills, limestone bluffs and soaring eagles. 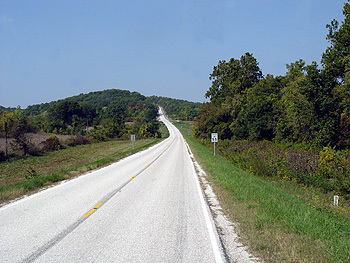 The road has also helped to boost the economy in Clarksville, Louisiana, and Hannibal in recent years. Named "Fifty Miles of Art," the old road acts as an artwork, crafts and galleries corridor, offering many opportunities to artists and photographers alike to capture magnificent panoramic views on canvas or film. The once abandoned buildings, particularly in Louisiana, are being preserved and renovated. Each of the three communities now has events planned throughout the year to encourage tourism and further promote revitalization. At Clarksville to the north of Louisiana, Highway 79-called the Little Dixie Highway of the Great River Road-has been designated as one of our Nation's Scenic Byways, encouraging more travel into the area and further boosting the economy. The National Scenic Byways Program was created by the Intermodal Surface Transportation Efficiency Act of 1991 or better known in FHWA circles as ISTEA. The program offers a way to preserve the scenery for everyone to enjoy, as well as economic benefits to local communities through tourism and various activities. From Hannibal's River Arts Festival, to Louisiana's Great Mansions and Estates Tour, to Clarksville's Lock and Dam 24 Bald Eagles Winter Migration, to the Fifty Miles of Art Tour, Missouri's Scenic Byway 79 brings the tourism and revenue that will restore and preserve the lifestyle along this historic stretch of the Mississippi River for everyone to enjoy.